In this blog, we will learn how to get the below collation details using "SERVERPROPERTY". 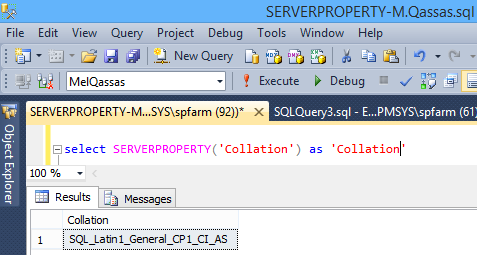 What's the "Collation" in SQL Server? For more details, check What is a SQL Server collation? Get the Windows locale identifier (LCID) of the collation. Get the SQL character set ID from the collation ID. Get the SQL character set name from the collation. Get the SQL sort order ID from the collation. Get the SQL sort order name from the collation.